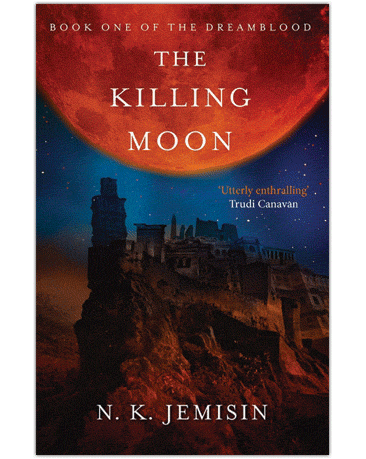 Before I tell you what I think of N. K. Jemisin’s The Killing Moon, you should know I don’t read a lot of epic fantasies where new worlds are built. 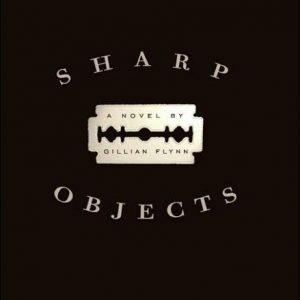 A lot of these fantasies come with maps in the beginning of the book, lists of characters, and sometimes glossaries of new words. I appreciate the imagination of someone who can build worlds like this, but I sometimes have a hard time getting into them, which is why I haven’t picked up the “Game of Thrones” books yet. I love the show, but I don’t know if I could follow it all in the books. After two seasons I still couldn’t tell you the names of the characters other than Jon Snow and his perfectly coiffed, curly hair. I typically like my fantasies to mix with our world, like how Harry Potter had us muggles to deal with and how Bartimaeus maneuvered in the different planes in our world, planes that only magical creatures can see. Since I declared this to you, you can probably guess that I didn’t love The Killing Moon. I didn’t hate it either. There are a lot of good things about it, but I could never quite get into the world Jemisin was building. 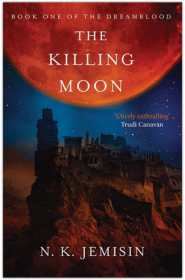 In the opening of The Killing Moon we meet Ehiru, a Gatherer who sneaks throughout the city-state Gujaareh at night, collecting the dreamblood of dying or corrupt inhabitants. Gatherers enter the dreams of people ushering their souls into a heaven-like existence for the goddess Hananja, taking what is left of their dreamblood. Dreamblood is used by the Sharers to heal others, but make no mistake about it, the Gatherers are killing people to get their dreamblood, but it is all seen as a blessing in their religious practices. The two people whose dreamblood Ehiru takes at the beginning of The Killing Moon are very different. 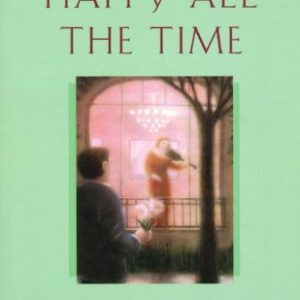 One is a dying man who welcomes Ehiru and willingly allows him to peacefully usher in his death. The other is a foreigner, a visitor in the city of Gujaareh, and he doesn’t have the same belief in the Gujaareen religious practices. Before Ehiru kills him this man calls him a “Gualoh,” or demon, and tells Ehiru he is being used. The next chapters introduce us to other characters, like the impressionable Nijiri, a new Gatherer and mentee of Ehiru, and Sunandi, an ambassador from Kisua, another city-state that is on the brink of war with Gujaareh. Both of these characters are important to Ehiru and his journey in the rest of the story because we see how Nijiri doesn’t question the religious practices of Gujaareh and how Sunandi does. They both are a push and pull for Ehiru when he starts uncovering things and questioning everything he believes. The reason I couldn’t get into this book is that for some things there are a lot of descriptions, sometimes too many, but for other things they are just matter-of-factly stated as if you’re expected to know what they are. For instance we get a very good picture of what Gujaareh looks like and the flooding that occurs every year; they even refer to how old they are by stating how many floods they’ve seen. But for other things, like narcomancy, there is little explanation, as if I’m supposed to know exactly what narcomancy is and how it fits into this world. Everything eventually gets explained, or you can eventually piece it together, but it all seemed slow and somewhat confusing. There is a glossary in the back of the book that can help, but when I have to rely on the glossary to remind myself what narcomancy, jungissa, shunha, tithebearer, umblikeh, and many other things are, I pulled myself out of the story and never got into a good rhythm when reading it. Once I had certain vocabulary down it did move faster and many things about the story are very interesting, but I couldn’t fully get into it. For those of you who love epic fantasies and complex world building, I think you would really love this book, but it’s not for me. I won’t be reading its sequel.